For my birthday, I got a mini pie maker from Bryan's parents! Yes, my birthday was in January, but this little contraption has been on back order since then and I just got it a couple weeks ago!! I wasn't able to use it right away, because our schedules got a bit crazy, but we finally put it to use this weekend! It was definitely worth the wait! I'll show you the step by step way we made our little pies! This is the coolest thing ever! We decided that for it's first use, we wanted to make some savory egg pies. As with most recipes, I took a look at it, and decided to put my own twist on it. It's a simple egg bake type of recipe, but I added more vegetables to the mix. The first step is to preheat the mini pie maker. Lay out your pie dough so that it gets to room temperature. Then, saute the vegetables (add diced ham, sausage or bacon if you like). We chopped up and sauteed green onions, baby bellas, red onion, garlic and spinach. Try not to use too many vegetables. Only 1/3 cup gets placed into each mini pie. While they are heating up, in a medium sized bowl mix 2 eggs with 1/3 cup whole milk (we used half and half because we had some around), 2 tsp dijon mustard and sprinkle on some salt and pepper. When the vegetables are done, add them to the egg mixture. I also added some crumbled feta cheese to the mixture. 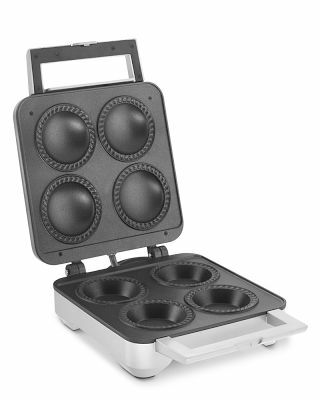 Cut the pie dough into rounds for the mini pie maker (the device comes with a cutter). Place the rounds into the mini pie maker and press into each depression. Fill each pie with the egg and vegetable mixture. Top with shredded cheese (we used mozzarella). 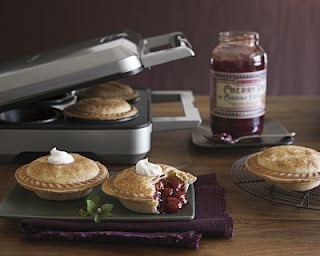 Cook in the mini pie maker for 8-10 minutes, checking periodically, and voila, you have mini pies to enjoy!!! It's such a beautiful day in Chicago that we were able to eat ours on our balcony! Dimitri wanted a bite too. This pie is from the first batch that got a little too done due to our lack of checking on them. These mini pies were SO DELICIOUS!! We typically have egg dishes with various vegetables sauteed in the mix, but the addition of the mustard and the crust gives this dish a completely new spin! I can't wait to try out the many recipes that are in the mini pie recipe book that came with the pie maker! THANK YOU to my awesome in-laws for this wonderful gift! Mine was a gift, so I am not sure where it was purchased. However, I do know that there are a couple mini pie recipe books on Amazon. Do you have the name of the pie maker so that I can google it and purchase it? Also, I do believe you could probably find cheaper versions of it on Amazon! Suzie, could you put in a 3 1/2 in alum. pie tin to make individual pies to go for the kids? it looks interesting . I definitely think you could make pies to go! If you're cooking the egg pies in the oven, it will take longer to cook. You'd want to follow cooking guidelines for an egg pie or quiche to make sure the egg gets all the way done. Good idea!